Brian Platzer has an MFA from the Johns Hopkins Writing Seminars, and a BA from Columbia University. His writing has appeared often in the New Yorker’s Shouts and Murmurs and McSweeney’s Internet Tendency, as well as in the New York Times, The New Republic, Salon, and elsewhere. He lives with his wife and two young sons in Bed-Stuy, Brooklyn, and teaches middle school English in Manhattan. "Brian Platzer's first novel captures a violent day in the uneasy life of a gentrifying Brooklyn neighborhood where the fragility of love, parenthood, class and race is put to the test. A bad day in Bed-Stuy is a vivid microcosm of the United States, but the hope Platzer suggests with his characters' healthy unmasking offers optimism for the whole country's days ahead." "Platzer, a writer and educator who lives in Bed-Stuy, is aiming high here, addressing race-related violence, the Black Lives Matter movement, gentrification, and other volatile topics. He succeeds in presenting multiple perspectives of dramatic yet familiar situations." "Brian Platzer's first novel is a savvy, heartfelt and utterly engaging examination of gentrification, love, race, ambition, money, parenthood and even faith. A Bonfire of the Vanities for millennials, it is a marvelous, and daring, debut." "Platzer writes insightfully about political isues while providing a panoramic take on New York that embraces the city's enormous complexity. This deeply moral book avoids easy conclusions and courts that ambiguity that is the hallmark of all great fiction." "Brian Platzer has written a thrilling debut novel about marriage, gentrification, parenthood, race, and the dangerous bargains we make with ourselves. At once a heart-stopping portrayal of a day of violence and a deeply realized portrait of the five people at its center, Bed-Stuy is Burning marks the arrival of a tremendously accomplished young writer. I can’t wait to see what he does next." 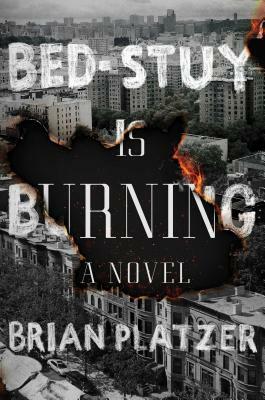 "Thirty years ago Tom Wolfe tackled New York excess with The Bonfire of the Vanities, and now Brian Platzer strikes his own match with Bed-Stuy Is Burning, the results just as timely and bright. Instead of Manhattan in the Eighties, Platzer turns his sharp eye onto present day Brooklyn: the simmering tensions of race and privilege, of cultural appropriation and identity politics, and of course real estate. The story gives voice to multiple characters in search of their American home – even police commissioner William Bratton has a supporting role – and Platzer has the confident novelistic chops to find the beating heart of humanity in everyone's struggle and striving. Bed-Stuy Is Burning is a wonderful debut. I look forward to whatever Brian Platzer might light up next." "If you’re looking for the novel everyone will be talking about … Bed-Stuy Is Burning by Brian Platzer."